Political 'Vitriol' Cited In Arizona Tragedy Law enforcement officials continue to piece together the facts from Saturday's shooting rampage that left a federal judge dead and a congresswoman critically injured in Arizona. 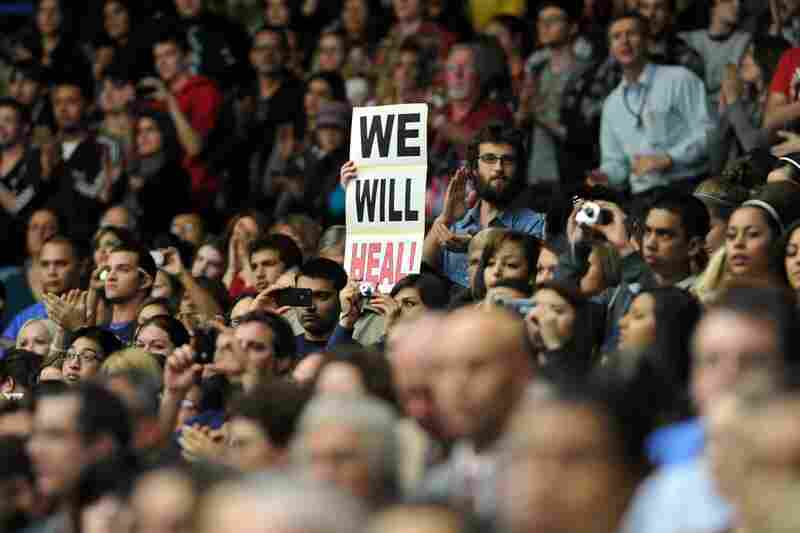 People attend the memorial event, "Together We Thrive: Tuscon and America" at the McKale Memorial Center in Tucson, Ariz., on Wednesday to pay tribute to the six people who were killed and the 14 wounded in the assassination attempt on congresswoman Gabrielle Giffords, who is fighting for her life in hospital. 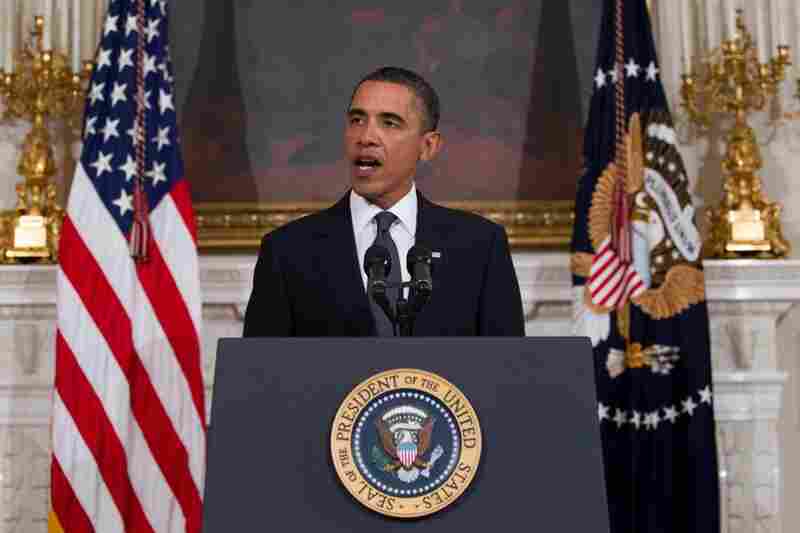 President Obama speaks at the memorial service. 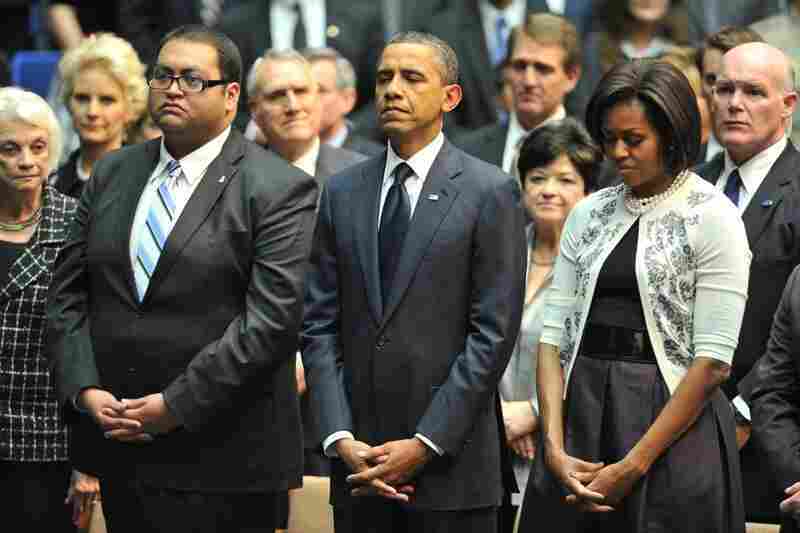 President Obama and First Lady Michelle Obama attend the tribute service in Tucson. 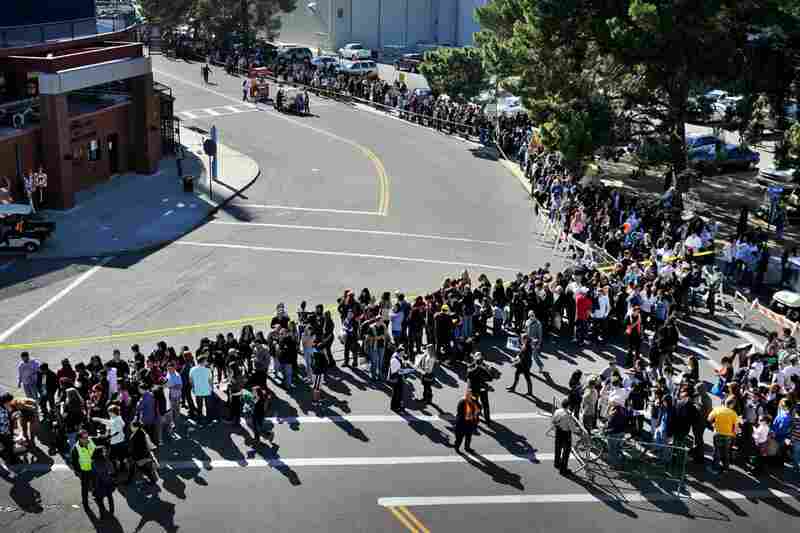 People wait in line for the memorial service honoring Saturday's shooting victims on the University of Arizona campus in Tuscon. 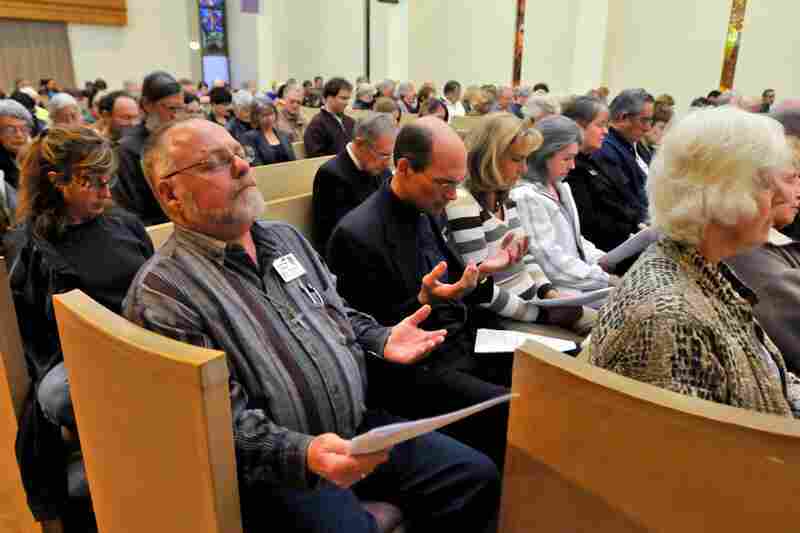 Parishioners attend an interfaith service at the Catalina United Methodist Church on Tuesday in Tucson. 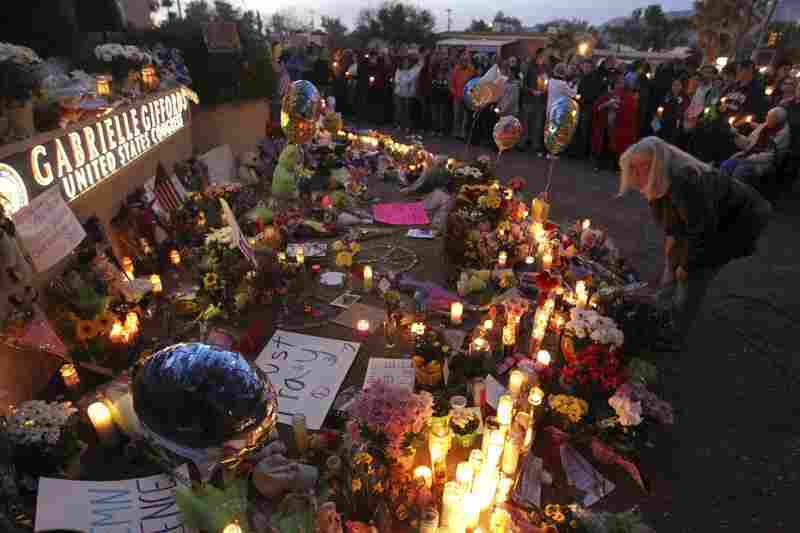 Supporters of U.S. Rep. Gabrielle Giffords (D-AZ) gather for a vigil outside her offices in Tucscon, Ariz. Giffords and 18 others were shot on Saturday outside a local supermarket; six were killed. Giffords, a moderate "Blue Dog" Democrat, was re-elected in November after a close runoff with Tea Party-backed Republican Jesse Kelly. House Speaker John Boehner (R-OH) re-enacts Giffords' swearing-in on Jan. 3 in Washington, D.C.
Jared Loughner is accused of opening fire at a "Congress on Your Corner" event being held by Giffords at a Tucson supermarket. 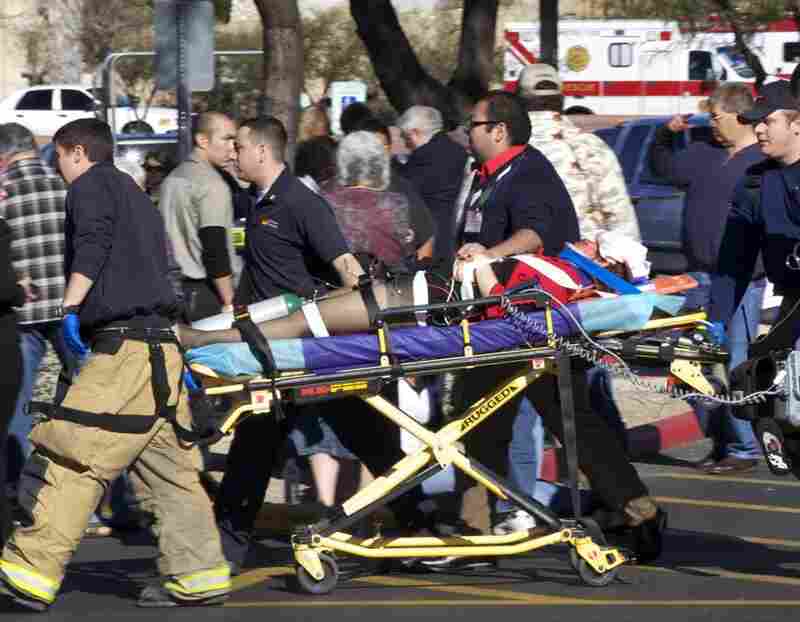 The gunman shot 19 people, killing six. Giffords was shot in the head at point blank range but survived. Loughner, 22, has a history of erratic behavior. Pima County Sheriff Clarence Dupnik described him as "unhinged." 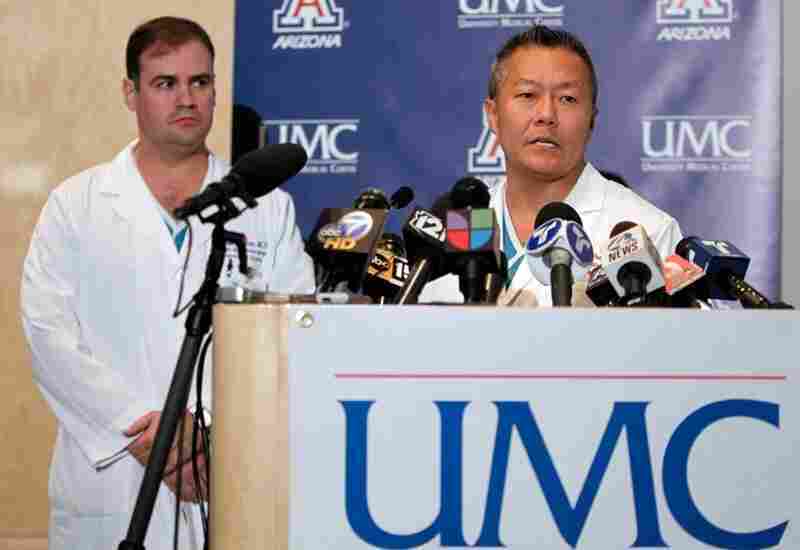 At a Sunday news conference in Tucson, Dr. Peter Rhee (right) and Dr. G. Michael Lemole Jr. said Giffords is able to follow verbal commands. At the White House, President Obama tells Americans to keep "all the victims and their families, including Gabby, in our thoughts and prayers." 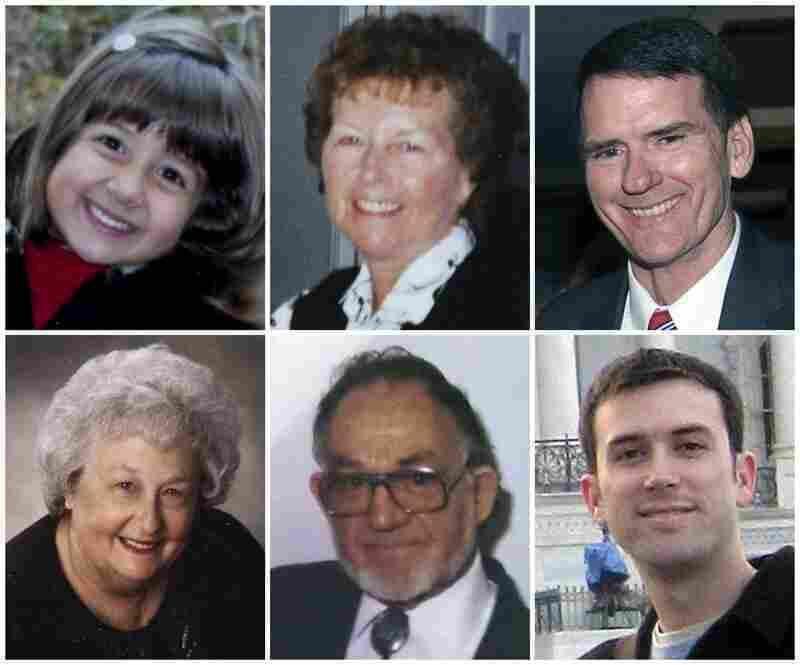 Victims of Saturday's shooting include (top, from left) Christina Taylor Green, 9; Dorothy Morris, 76; Arizona Federal District Judge John Roll, 63; and (bottom, from left) Phyllis Schneck, 79; Dorwin Stoddard, 76; and Gabe Zimmerman, 30. 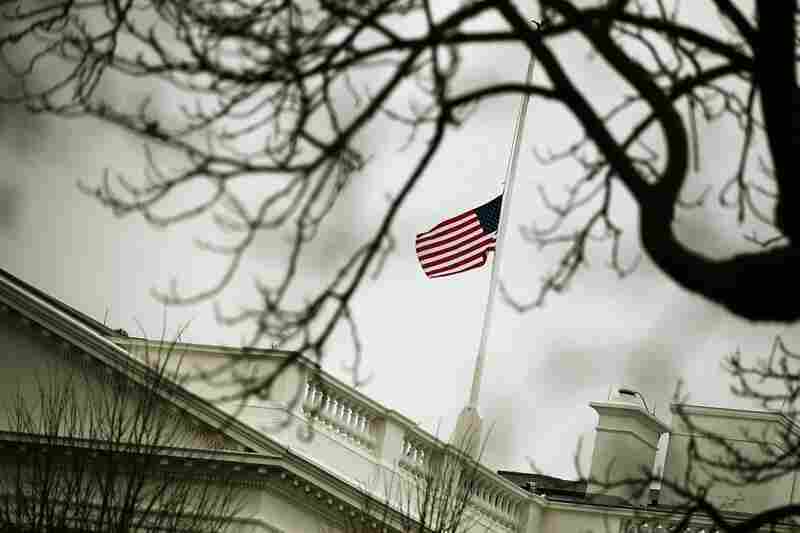 The flag on op top of the White House flies at half-staff Monday in honor of those killed and wounded in Tucson. Loughner appeared at the Sandra Day O'Connor Courthouse in Phoenix on Monday. He is facing federal charges in the attempted assassination of a member of Congress, the murders of federal Judge roll and Gabriel Zimmerman, and two counts of attempted murder. 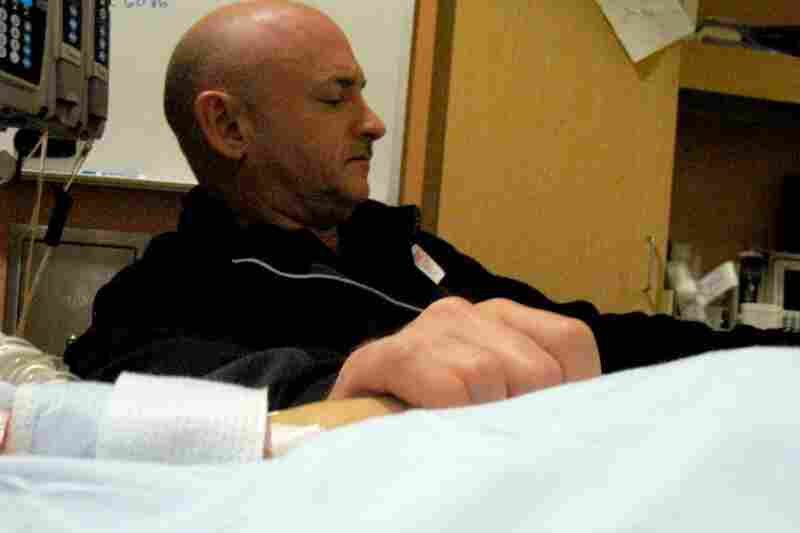 Giffords' husband, Mark Kelly, holds his wife's hand in the congresswoman's hospital room at University Medical Center in Tucson. Giffords remained in critical condition Wednesday. Law enforcement officials continue to piece together the facts in Saturday's shooting rampage that left a federal judge dead and a congresswoman critically injured in Arizona, and some are questioning whether divisive political rhetoric may have played a role. 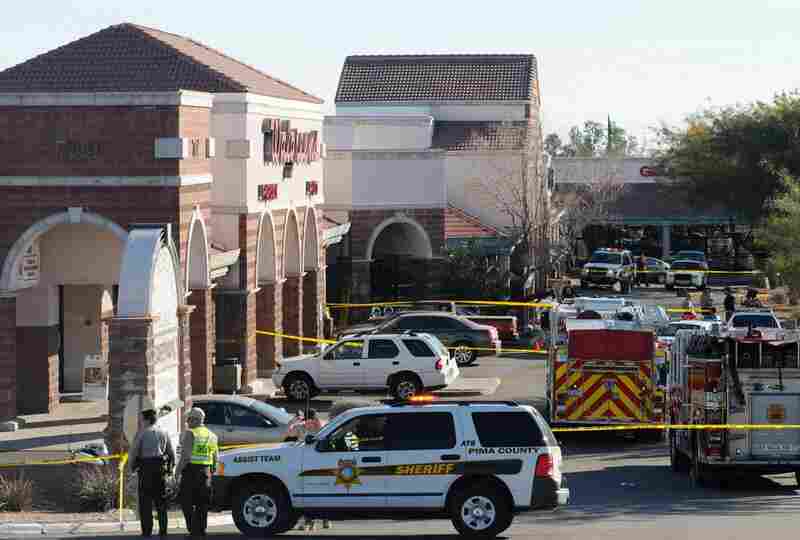 At least six people died and at least a dozen were injured in the Saturday morning shooting at a Tucson, Ariz., grocery store parking lot, in which the gunman specifically targeted Arizona Rep. Gabrielle Giffords, Pima County, Ariz. Sheriff Clarence Dupnik said. 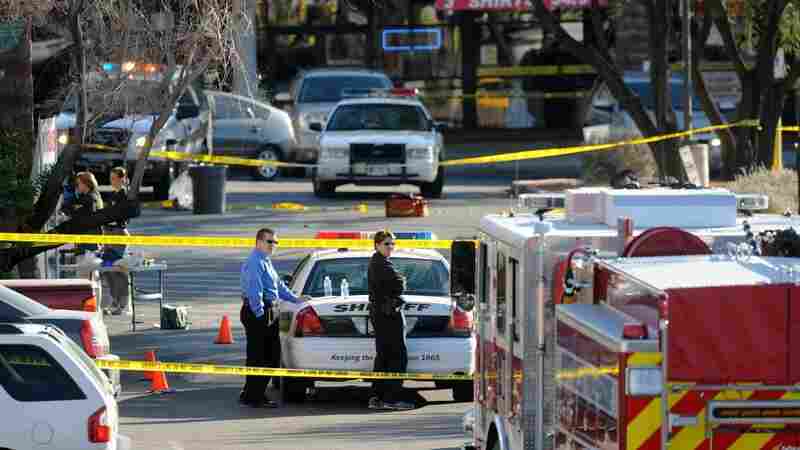 Giffords was shot in the head, and the shooting continued until citizens tackled the suspected gunman, he said. The dead included John Roll, chief judge of the U.S. District Court of Arizona. 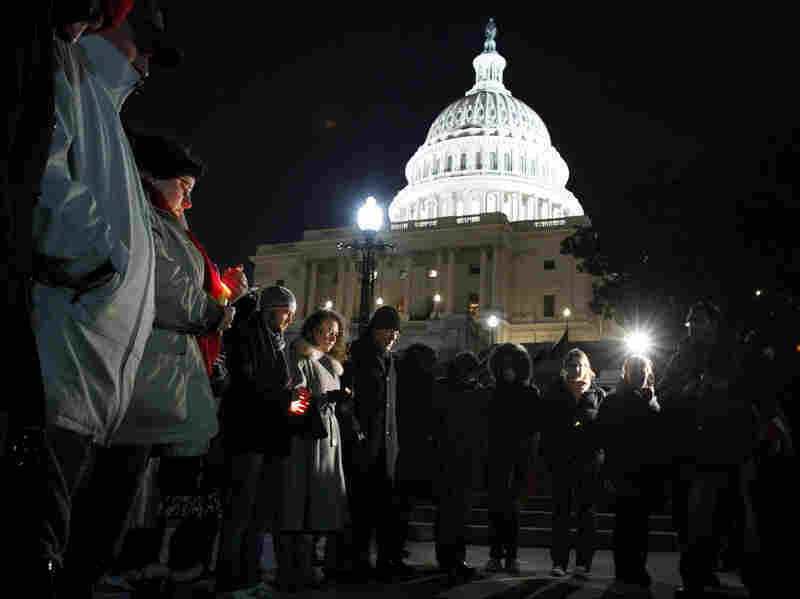 Also killed was Gabe Zimmerman, 30, the congresswoman's director of community outreach, and a 9-year-old girl. Two other Giffords staffers were injured. At a news conference Saturday night, a clearly emotional Dupnik, who has been close to both Giffords and Roll, repeatedly cited what he characterized as the "vitriol" that has infected political discourse. He said that his own state has become "the mecca for prejudice and bigotry." There is reason to believe, he said, that the shooting suspect "may have a mental issue," adding that people like that "are especially susceptible to vitriol." "That may be free speech, but it's not without consequences," he said. The suspected gunman was tackled and held by people at the event until police arrived and took him into custody. 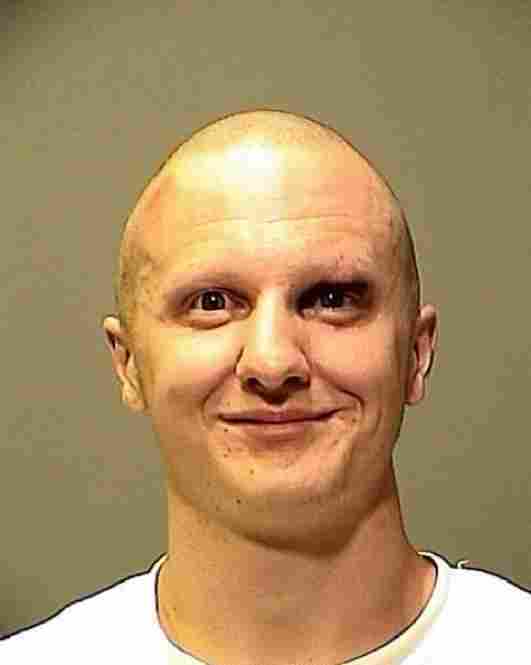 Law enforcement sources told NPR the suspect was 22-year-old Jared Lee Loughner. Dupnik declined to name the suspect, but said he "has kind of a troubled past — I can tell you that — and we are not convinced he acted alone." Officials have a photograph of a second "person of interest," a 50-year-old white male, Dupnik said. "We have an individual we are actively in pursuit of, but I cannot tell you who he is at this point," the sheriff said. The suspect still had ammunition in his weapon when he was tackled, Dupnik said. Law enforcement officials had previous contact with the suspect and he had made threats, the sheriff said. NPR and other news organizations reported earlier Saturday that Giffords had died. NPR member station KJZZ in Phoenix reported the recently re-elected Democratic congresswoman and six others had been killed by the gunman, based on a source in the Pima County Sheriff's office. 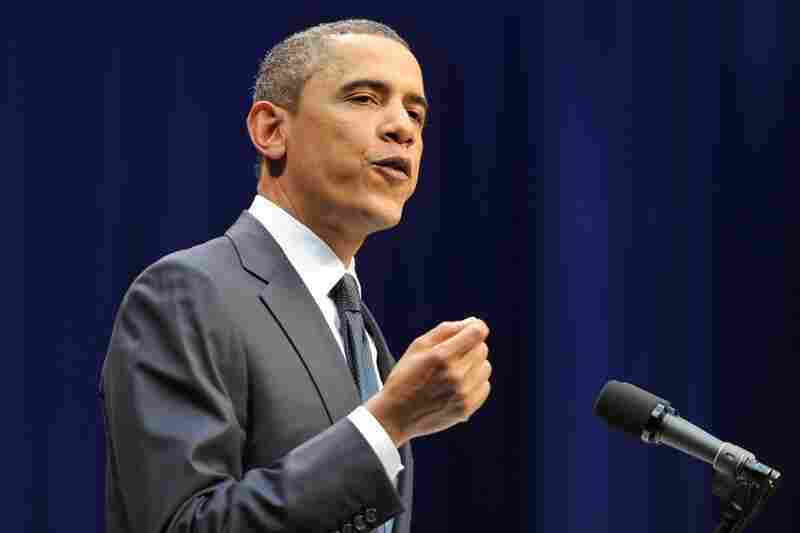 "Gabby Giffords was a friend of mine," President Obama said Saturday afternoon in a nationally televised statement from the White House. "It's not surprising that today Gabby was doing what she always does: listening to the hopes and concerns of her neighbors." "This is more than a tragedy for those involved," he said. "It is a tragedy for Arizona and a tragedy for our entire country." Giffords, a moderate "Blue Dog" Democrat and gun rights advocate who in November eked out a win for a third term over Tea Party-backed Republican Jesse Kelly, underwent surgery at University Medical Center in Tucson. Hospital Director Pete Rhee said that a bullet had entered and exited the congresswoman's head, but that he was as "optimistic" as he could be in the situation. There has been a rush to determine what had prompted the massacre in a state that has been roiled by incendiary debate over illegal immigrants and has also become ground zero for those questioning Obama's birthplace. 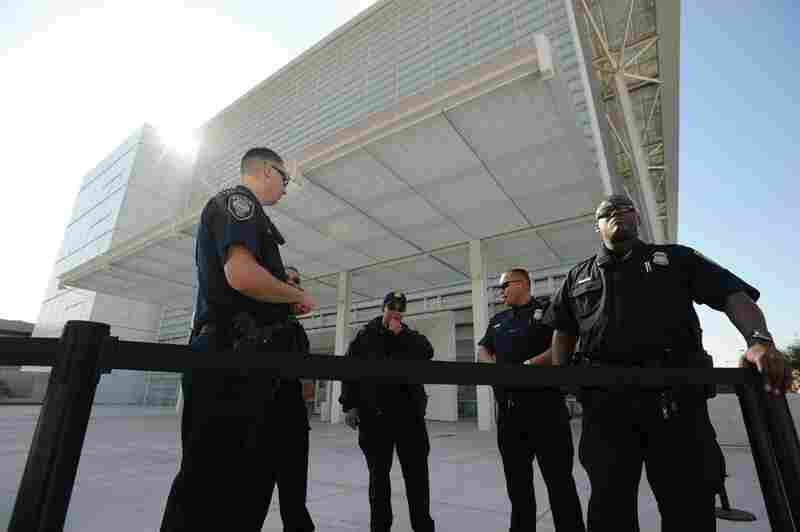 "It's not a good atmosphere right now, though I'm not saying that's what prompted this," said University of Arizona law professor Andy Silverman, who knew Roll well. "But things in Arizona are very tense, and we've become the incubator for a lot of immigration-related matters and now for the birthers, too." Giffords' fellow Arizona congressman, Republican Jeff Flake, recalled that she was unfazed after her Tucson office had been targeted by vandals who broke a window on the eve of last year's health care vote. During an interview with MSNBC after her office was vandalized, Giffords noted that her district was on Sarah Palin's "crosshairs" list of targeted congressional races. And it had been reported that in 2009, Roll and his wife received 24-hour protection for at least a month after receiving death threats after certifying a multimillion-dollar lawsuit illegal immigrants had filed against an Arizona rancher. Palin, in a statement, offered "sincere condolences" to Giffords and the other victims. "On behalf of Todd and my family, we all pray for the victims and their families, and for peace and justice," she said. As information about Loughner began to emerge later in the day — including online videos and comments posted under the same name as the Tucson native and Mountain View High School graduate — those in Arizona and Washington cautioned against jumping to conclusions. Some online statements attributed to Loughner suggest an obsession with the nation's currency system and with grammar. In one online video posted under Loughner's name, an American flag is burned. "It has been a difficult time politically for the country, and I'm sure bloggers and others will go crazy laying blame — on gun rights, on Tea Party people — trying to figure out who's fault it is," said Randy Graf, a Republican who served in the state Legislature with Giffords and lost to her in her first run for Congress. "As we hear more about the alleged shooter, it seems he may be more like a person with problems whom you can't control," said Graf. He said that despite their political differences, he and Giffords "got along great." Former Rep. Jim Kolbe, the Republican whose seat Giffords won in 2006 when he decided not to seek re-election, said that it is "inappropriate speculation to talk about what the political environment might be." "We don't have any information yet," said Kolbe, who was a good friend of Roll's. "I don't think members of the media and the public realize that public officials receive threats all the time and have their offices vandalized." Giffords, 40, has been considered an up-and-coming Democrat, with a moderate streak and an astronaut husband. At age 32, she became the youngest woman ever elected to the Arizona statehouse. She was described Saturday by Arizona University law professor Lynn Marcus, co-director of the school's immigration clinic, as "very accessible and very warm," someone many know on a first-name basis. "She's taken a position in support of comprehensive immigration reform, but she hasn't been anyone who is perceived as a liberal or pro-immigrant," Marcus said. "Her constituents in southern Arizona are ranchers and rural Arizonans." She has advocated enforcement and securing the border as key to handling the challenging issue, Marcus said. Giffords was expected to lose her race last year in the Republican-leaning 8th Congressional District. As Flake said, there was a "very strong headwind" against her — and all Democrats. "She got re-elected because she's tenacious," he said. "She's tireless." Born: June 8, 1970, in Tucson, Ariz.
Kolbe, who has known Giffords since they served together in the state Legislature, said she is "very outgoing, effervescent and thoughtful." She has a master's degree from Cornell University and took over her family's tire business in Tucson. Roll, a 63-year-old Pennsylvania native who received his law degree from the University of Arizona law school, was appointed by George H.W. Bush in 1991. Silverman, who coordinates a clerk program with Roll, said he considered the judge hardworking, smart and low-key. "If you put labels on judges, he would be considered more conservative, but I think he's apolitical," Silverman said. U.S. Supreme Court Chief Justice John Roberts said Roll's death was "a somber reminder of the importance of the rule of law and the sacrifices of those who work to secure it." Dupnik said that Roll, whom he described as "one of the finest human beings I ever met in my life," had stopped by Giffords' event on his way home from Mass, which he attended daily. Roll and the congresswoman were friends, the sheriff said, and the judge just wanted to say hello before he went home to "do the floors," like he does every Saturday. As the news continued to spool out Saturday, apolitical was the tone many, including Graf, were seeking. "We'll get through this," Graf said. "There's time for politics later."